‘D.I.Y. Trip Planning’ rocked 2016. 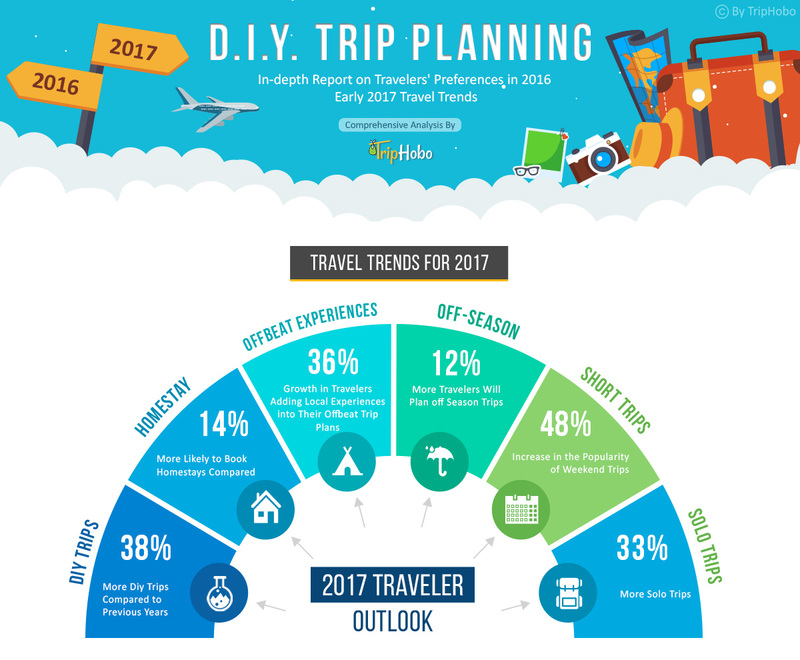 Reviewing the trend of the way travelers planned trips in 2016, the do-it-yourself planning seemed to be the most preferred choice for most of the travelers, especially the millennial travelers. Focusing more on experiential travel, travelers chose to plan their trips meticulously, with more and more personalization and this has also impacted the choice of the destinations that the travelers preferred. Summarizing the travelers data through users at TripHobo.com, there are some surprising elements of how travel evolved in 2016 and will continue to do so in 2017. The majority of D.I.Y. trip plans came from countries like the United States, China and India. These countries are also predicted to be heading the leader-board for D.I.Y. plans in the coming year. European countries are not far behind. Scandinavian countries Finland, Norway and Sweden show the highest per capita DIY trips. The across-the-board increase for D.I.Y trips shows that this trend is here to stay. Surprisingly the trend is growing faster in emerging markets. The good old destinations like France and Italy were rock-solid on top positions, but surprisingly, there were new entrees to the list of most visited countries. More number of itineraries were planned to Japan and Russia as compared to previous years, which proves that the 2016 traveler was experimental in choosing the destination. But this didn’t keep the crowds away from the popular attractions like the Eiffel Tower and Colosseum and they continued to be the most visited attractions in the world. While luxury vacations are gaining immense popularity, the trend observed in 2016, was striking. Travelers ditched the conventional hotel stay and preferred to book homestays and B&Bs instead. This is evident from the 31% increase in Bed and Breakfast bookings as compared to previous years. Among hotels, 3-star was the most preferred choice over luxury hotels with 62% choosing a 3-star accommodation. According to the data of TripHobo users, an average of 62% travelers chose to plan a DIY trip whereas an average of 23% Travelers chose to customize the plans created by other travelers on TripHobo. 14% of the travelers chose the conventional ready-made packages. This DIY trend shows that fewer travelers are opting for ready-made travel packages as compared to previous years. Longer trips were planned with more care compared to the shorter ones, as evidenced by the much higher number of revisions made to itineraries of longer duration. Travel as we know is going to transform in the coming years with an estimated 38% rise in the use of DIY trip plans. In terms of destinations, 36% travelers are predicted to choose offbeat places and experiences over conventional holiday destinations. The popularity of short trips continues to rise with a predicted growth rate of almost 50% . A third of the travelers are anticipated to opt for a solo trip. Fewer than a sixth of the travelers are expected to plan an off-season trip to avoid crowd and surcharges. Homestays will continue to dominate accommodation choices with a growth of 14%.